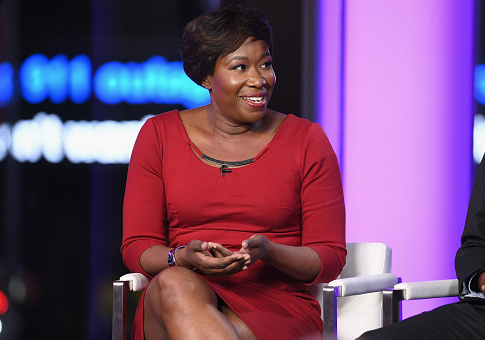 MSNBC host Joy Reid on Wednesday gave credence to an unsubstantiated conspiracy theory perpetuated by the chairman of the Democratic Coalition, a group dedicated to resisting President Donald Trump's agenda. Jon Cooper, a former senior official on Barack Obama's presidential campaigns who served as national finance chair for Draft Biden 2016, tweeted that Trump spoke with Russian President Vladimir Putin before signing a Russian sanctions bill, citing a "top White House source." "No word yet on what #PutinsPuppet told him, but stay tuned," Cooper added. Reid retweeted Cooper's message, adding an emoji with eyes. MSNBC anchor Stephanie Ruhle also retweeted the claim. Cooper's organization has repeatedly been the originator of unverified claims about Trump and his administration, a trend that has been documented by Business Insider and even PolitiFact. Working at the Democratic Coalition with Cooper is Scott Dworkin, a frequent contributor to Reid's show. Dworkin tweeted that he heard the same story as Cooper, but from a different source. According to Cooper and Dworkin, they have two top sources in the White House, despite their organization's mission to oppose all White House efforts. "The organization now exists to hold the Trump White House accountable, and is directly countering Donald Trump, along with Republican elected officials and candidates who support him, through aggressive digital and traditional advertising, grassroots action, in-depth opposition research, and a nationwide rapid-response team," according to the Democratic Coalition's website. "As part of its Resistance efforts the Democratic Coalition has created a Boycott Trump app that has over 350,000 downloads and #TrumpLeaks, which has been featured on MSNBC's AM with Joy Reid," the site added. No news outlets have corroborated Cooper and Dworkin's claims about Trump calling Putin before signing the Russia sanctions bill. This entry was posted in Politics and tagged Donald Trump, Joy Reid, MSNBC, Russia, Stephanie Ruhle. Bookmark the permalink.